Isn't he lovely? Who couldn't love a man who isn't afraid to burn his own dessert??? 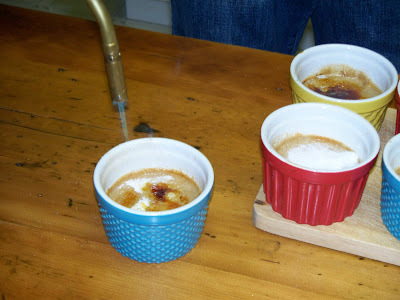 We really enjoyed the creme brulee but it would seem that the sugar was a little too thick as it took a bit of effort to break through the top...but we did enjoy it anyway! Wow! 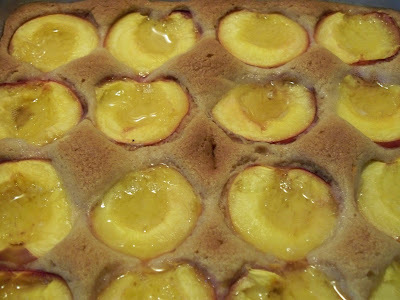 That is what I have to say about Michelle of Bake-en's selection, Dimply Plum Cake on page 41. 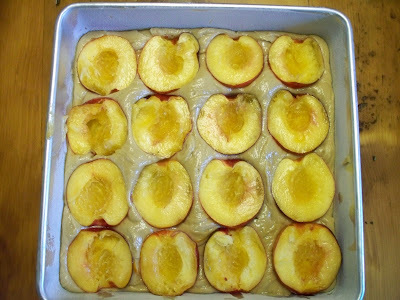 When I saw this recipe I was very excited as we had company in town from the UK and it was an awesome opportunity to showcase some of our local yummy fruit! 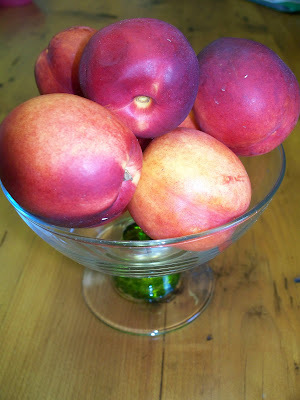 The farmer didn't want to sell me these nectarines because they weren't perfect but when I said they were for a cake he was delighted and discounted them (and a bunch of other produce I bought) and off I went! I have to admit...I LOVE paper!!! 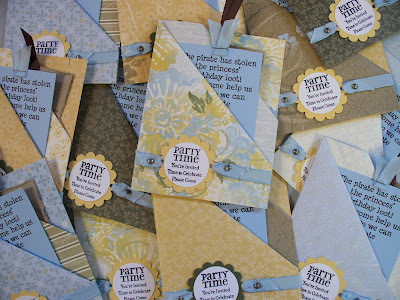 I make invitations by hand, thank you cards, birthday cards you name it! I love to create cards and mail them! Anyway...after our big birthday for the kids this year I thought I would let go a little...so I used the Cricut to cut out the bits to make Pirate and Princess Thank You Cards. Then I passed all the bits over to my kids and let them do the assembly! It was hard to let go but I must admit they did a great job! 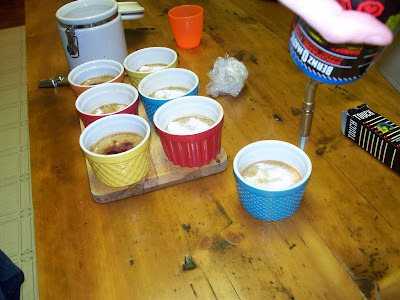 I am working on letting them do more handiwork I even made them their own labels!!! I will post them later. When I was done letting go I made Thank You Cards for Simon's welcoming gifts...I have been planning these cards for ages so I was happy to finally get around to them! They are simple enough...some paper, a bit of ribbon and a little stamping. I printed Baby on Acetate Sheets and just layed them over my stamped 'BOY'. All paper, stamps and inks are Stampin Up! Well, as with everything (well most things) these days, I am running behind schedule. 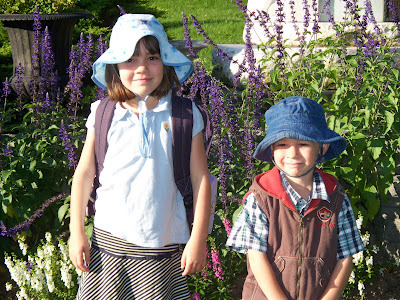 The kids started school a few weeks ago now and are happily settling in. Sarah is in Grade 1 now...such a big girl full days and she even eats lunch there too! While Sean has just begun JK and he is loving it!!! Just to make sure the teachers start their year off right...we made this delight in our first Creative Kids session of the school year. 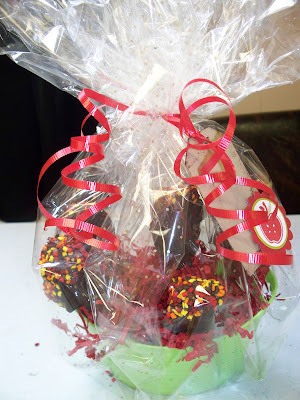 We dipped apple wedges into melted chocolate and then decorated them with sprinkles...it was hard to convince the kids that they 'wanted' to give them away!!! We wrapped them up and made little tags to go with them and they were set to go! What teacher wouldn't like this apple on their desk? 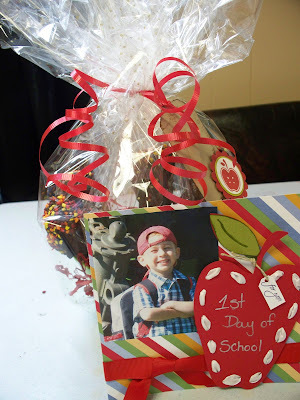 Now it's important that the kids have something to hang onto as well so, we made a 6x6 Scrapbooking page to highlight their first day of school. You can see that the one below is my sample but the kids did a great job with lacing the apple and putting the page together! 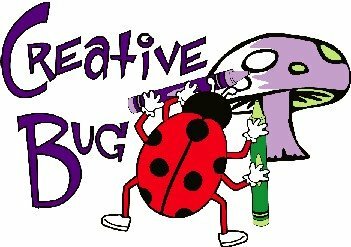 We have our Thanksgiving Creative Kids session coming up on September 28th! We hope to see you there! I followed the directions on Joy's blog Jar full of Joy to create these double pocket cards with some of my (now retired) Stampin' Up! Designer Paper. I then created tags with Bashful Blue and Kraft Paper embellished them with a bit of ribbon, some hardware and a few other bits and there you go! 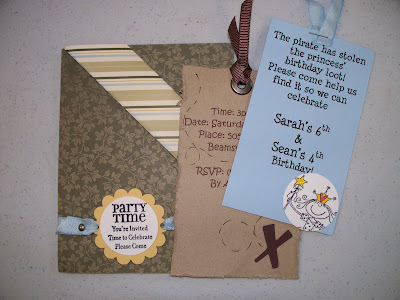 some theme related invitations! 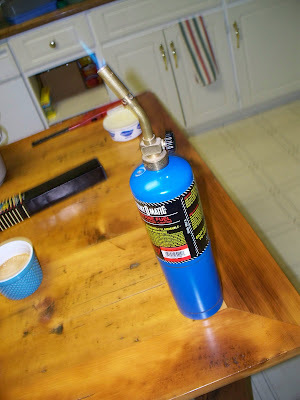 Well, I did manage to get this week's recipe made but I have to admit there is no photographic evidence to prove it. I was delighted with Claudia of Fool for Food's choice of Chocolate Chunkers on page 70 of Dorie Greenspan's Baking: From My Home to Yours. 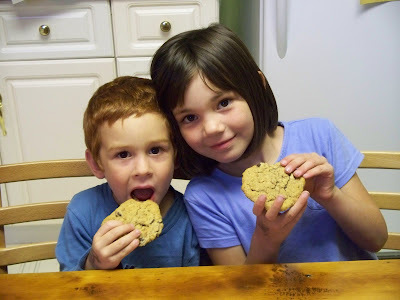 They are wonderful cookies but things have been so crazy with the kids and the baby that you will just have to take my word for it...that or check out some of the other wonderful bakers on the Tuesday's with Dorie site. This week's recipe was selected by Rachel of Confessions of a Tangerine Tart. I was excited but felt a little bad because our little guy is lactose intolerant and there was just no way to make the Chocolate Whopper Malted Drops on page 85 lactose free. But Sean decided to play with us anyway...here he is waiting for the fun to begin! Are you sure I can't eat this Mummy? It looks good!!! The interesting part, well to me, was that whenever Sean got batter on himself he would insist that it be cleaned off immediately! Sometimes his sister would clean it up and other times the cloth would come to his rescue but he was very conscious of the issue. It's amazing that at 4 he deals with it so well! Here are our Whopper cookies...they were huge again! I will have to move down to teaspoons because the kids just can't seem to make small cookies with tablespoons!!! I will make sure we have more shots of Sarah next time! Chocolate, Oatmeal and Peanut Butter Oh MY! 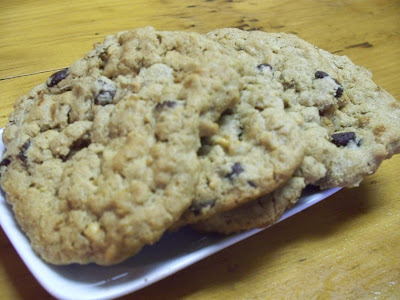 So here we are making Stefany of Proceed with Caution choice, Chunky Peanut Butter and Oatmeal Chocolate Chipsters! 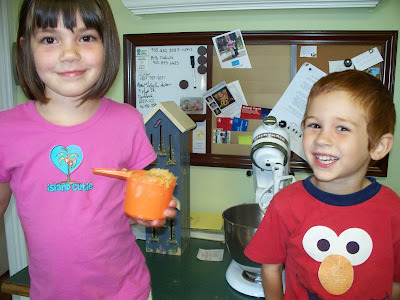 The kids were thrilled by the choice...and hoping for some of that Kraft PB that we bought for the recipe! 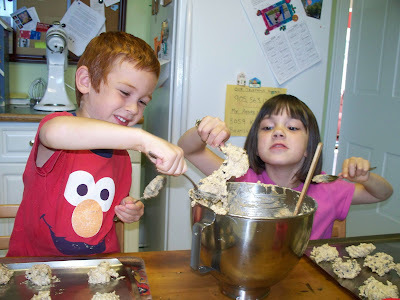 Now here are our testers enjoying their cookies...this was a few days later as the kids had a bumpy start to the week and had to earn their treat this week! Most of the cookies were brought to work by my husband and his colleagues are wondering when we will make them again...I have to admit...this was not one of my favourites...they were okay but those granola grabbers from a few weeks ago were FANTASTIC!